Whether you are snowed-in and avoiding the blizzards, or trapped under a deluge of rain (our dreams of white-capped hills thwarted for the time being) there’s not much to top a cheering batch of chewy, rib-sticking flapjacks and a steaming mug of tea or fresh coffee. Guaranteed to warm the cockles and put a smile on the face. Flapjacks are often overlooked for posher cakes like macaroons and cupcakes and aren’t really considered a treat at all. Their practicality and lunchbox friendliness make them seem like the healthy alternative and at times they are wheeled out as the last resort when more exotic treats or something ‘nicer’ isn’t around. 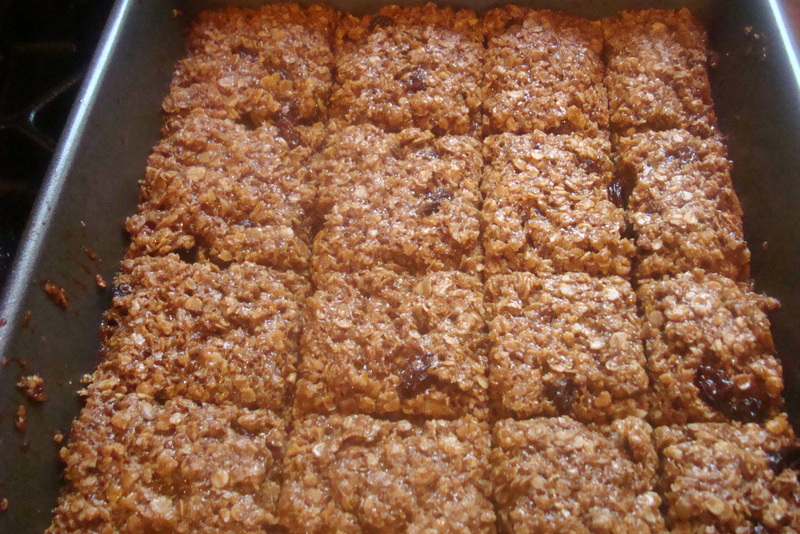 I think its high time we sung the praises of the humble flapjack and stopped treating them as the poor relation. For me flapjacks are about as decadent as you can get; what’s not to like about a sweet concoction of sugar, syrup and butter. Tooth-achingly rich, incredibly easy to make and cheap; they are a the perfect recipe for an afternoons baking with bored kids and you only need the most basic store cupboard ingredients. We like them as they come; usually straight from the tin, still warm, but cool enough so they have a little bit of crunch. The basic ingredients will suffice but if you feel the need to tip a nod to their healthy reputation you can add a handful of nuts, seeds or dried fruit. 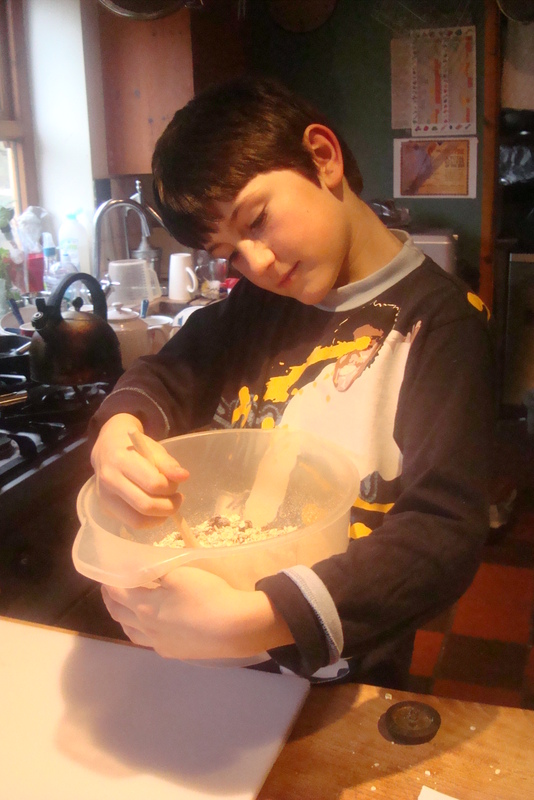 So on a drab wet Saturday Aidan decided he would make a batch. He had a to improvise a little; he used a tablespoon of treacle because we didn’t have quite enough syrup, which produced a darker flapjack, but didn’t overwhelm the flavour as much as honey tends to. He also insisted on adding 50g dried fruit. He also added a pinch of Halen Mon vanilla salt to the butter and sugars as they melted. Put the butter, sugar, syrup and pinch of salt in a saucepan and heat gently until melted. Give it a regular stir so the sugar doesn’t stick and to check if it has melted. Put oats and fruit into a large bowl. When the sugars have melted pour over the oats and stir well and until the oats are well coated. 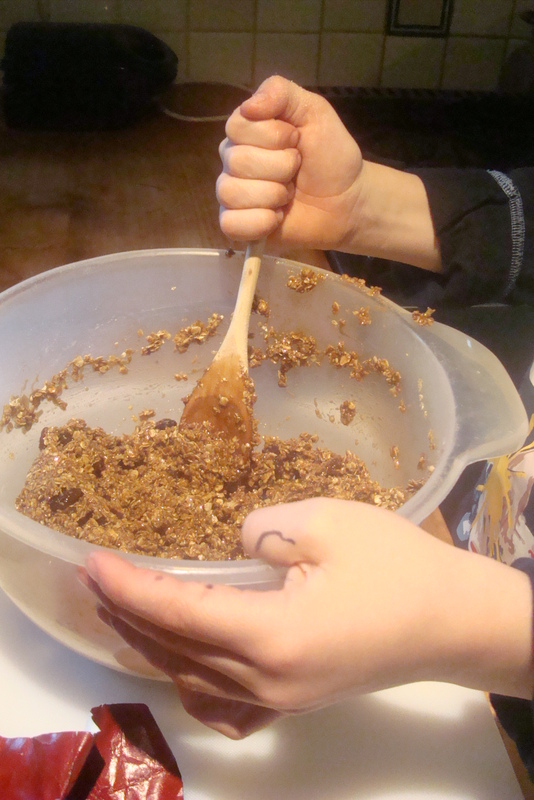 Press the mixture into a greased baking tin (20×28 cm) lined with baking paper or parchment. Bake in a pre-heated oven gas mark 4, 180 degrees C, 350 degree F for about 25 to 30 minutes. When ready remove from the oven and leave to cool in the tin. While still warm cut into fingers or squares.